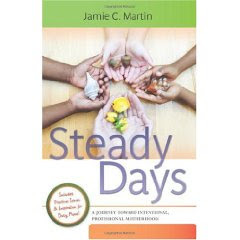 Steady Days by Jamie C. Martin. this is a lovely book, comprised of short, manageable chapters that help you approach motherhood in a more intentional, professional manner. Mostly, she'll help you plan and give you a vision for flexible structure in your family's day- the aim being steady routines and rhythms for your child's day. The appendix has several helpful worksheets for managing daily life with children. This book is practical and inspirational. I liked the practical part! I do think this book was aimed at families with young children, for moms with Kindergarten children and younger, this will be a perfect fit. make sure your comment links back to where I can find you, or leave your email in your comment so I can contact you if you win. winner will be chosen sometime Thursday night...because I am anything if not exact..! (contest will close at 8 p.m pacific time Thursday) *extended to 10pm pacific time!